Anyway, welcome (again) to all the newcomers! We're thrilled that you decided to post here. I lured them with my discount lessons on how to reduce the carbon footprint of their holes. Thanks for the welcome everyone. It took me a while to find this place. Forumshire is much bigger than Bree. A whole extended family just snuffed, bargain rates on holes everywhere. yes R.A this place is a bit of a warren like Tookborough. some of those holes are a bit smelly and cobwebby though, so choose carefully. Get a nice barrel instead, with a jacuzzi and bar. If we got a new issue of the DP out of this, it can't be all bad. We Ladies of Forumshire are joined, as one, In a united Front against the egotistical ramblings of a Dickensian view held mainly by one individual precisely. We fought heartily for the right to vote, Equality, & against the censorship of all females everywhere !. This, ladies, is one more obstacle that we can over come !, We WILL oppress the Tyrant, in all shapes & form !, We shall stand firm,side by side,arm in arm, till Women are shown in their right place,as a formidable ali OR as a substantial Foe ! We will not bow down to pressure,or racism against us,or to hypocracy or harrassment ! We firmly believe we can scurge out this narrow minded,blinkered idea,that met its death ages ago ! We are "The Liberated Front of Hobbits"! And we will not submit! Thats all very well but I trust you plan to get the dishes and the hoovering done before you start? You see? This is why lady hobbits shouldn't even be allowed to vote in the Mayoral elections let alone stand in them. Lowers the whole tone that sort of talk best set the menfolk to run Forumshire. I enjoy a game of "cat & mouse", I like to torment & annoy. When I get sarcastic with my other half, well, I can keep it going for DAYS!. I might get away with this with you Azriel for a while but when the actual Mayor turns back up I may need an asbestos kilt! what happened here? what did I miss? Are you bravely trying to say theres a Hot smoking Hobbit under that skirt,er, kilt !? Ive heard all that before, its all wishful thinking! ( is this a euphemism for "flame thrower"?)...... more like a damp sparkler ! Ony if I drop my pipe! Petty: are you sure your "pipe" is long enough to reach the ground ? !, or even venture out in daylight ?, If your "blueness" turns green,its due to the formaldehyde youve hidden in the dark recesses of your pleats. Its not meant to be absorbed THERE, (youre meant to DRINK it)..You blue buckie bod ! If it's the chili buckie I gave you for your birthday, I know exactly were! 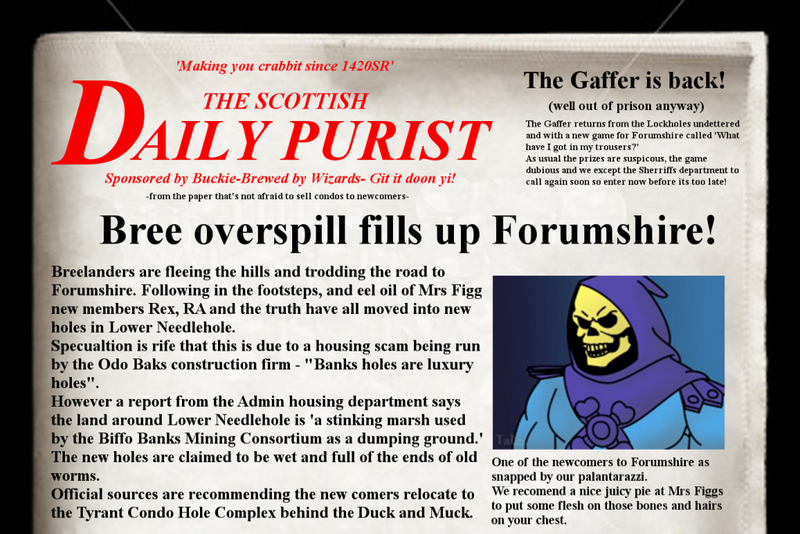 meanwhile...in Forumshire there was a horrible smell of poop..